And flowers at the Alamo! 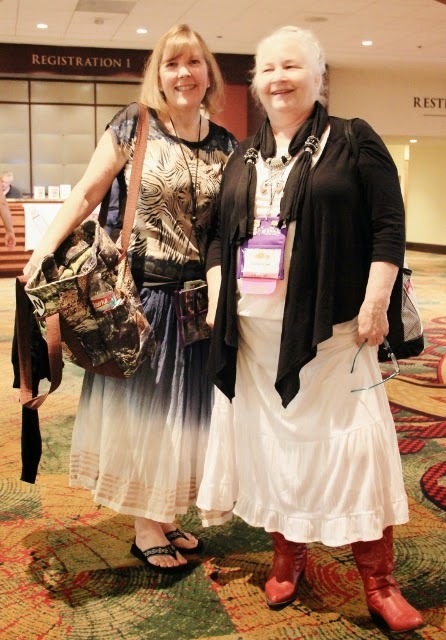 #RWA14 = Romance Writers of America Conference 2014!! I asked if Carolyn would wear her red cowboy boots and she did for our breakfast excursion! She is the sweetest! And then we had even more of a treat! Sharon Sala sat with us and she shared some wonderful tales that were absolutely fascinating. 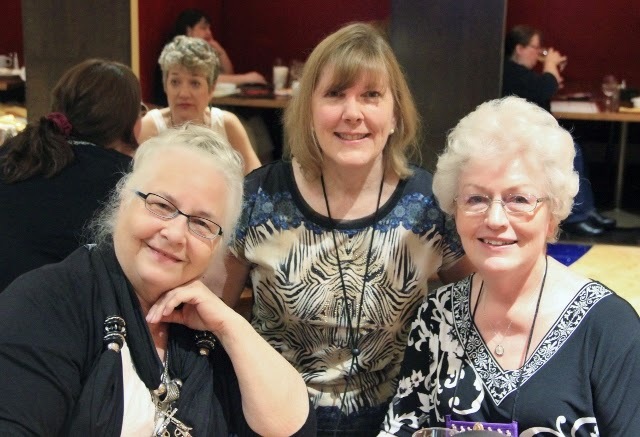 If you are in the San Antonio area, I will be signing here: The RWA 2014 Literacy Autographing will be held on Wednesday, July 23, 2014 from 5:30 – 7:30 p.m. at the San Antonio Marriott Rivercenter Hotel in the 3rd floor ballroom. This event is open to the public. It looks like from the seating plan, I’ll be nearer to the cashier’s checkout, last rows. Have wolf pins and book marks! Fans will get one entry into the drawing for every book they purchase or pick up from a signing. They don’t have to find everyone in order to win. But we have a gorgeous Kilted Muse prize package for the winner. I will also have CHRW buttons. They’re always beautiful. So look for the teal balloons for the Kilted Muse Scavenger Hunt (for the Literacy & Publisher Signings) !!! Our signing authors will be designated with TEAL HEARTS at the #RWA14 signings this year. If you’re a fan of Highlander Romance and attending any of the signings in San Antonio, please pick up a #KiltedMuse Scavenger Hunt page and be entered to win an amazing bag of Kilted Muse swag. Participating authors will include Eliza Knight, Margaret Mallory, Keira Montclair, Ruth Seitleman, R.L. Syme… and more authors are being added! Find the TEAL HEARTS and you’ll find the CELTIC HEARTS! Thanks to all the ladies who made it a success! Willa Blair and Clair Delacroix! We had tons of prizes and I made 2 Amazon lists! 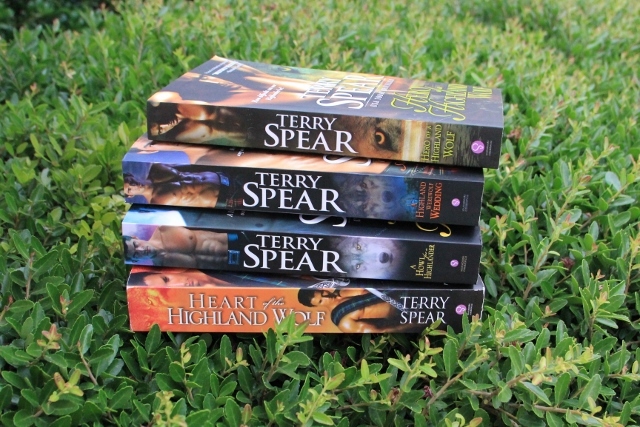 The bundle for the first 2 books in the Highland series: Winning the Highlanders Heart, book 1, and The Accidental Highland Hero, book 2, which is priced at $3.99 for the 2 books is now available on Amazon and Kobo. Still waiting on Google Play and Barnes and Noble. And we have an all-star cast of authors joining me in another FB party, this one for Hero of a Highland Wolf, more on that later. Still waiting on a couple of the authors to decide on times. Then my roommate for the conference coming up after this next one informed me we could be drinking champagne while I posted. What??? Ack!!!! My release date is on the day I’ll be at another conference. The last time that happened, I made USA Today Bestseller. So maybe another miracle??? Okay, off to get a million things done. Have blog tour stuff, promised I’d make 50K by this weekend on Call of the Cougar, and need to pack. And to everyone who dropped by to party or already bought the new releases, thanks so much!!! Note to self: Quit Overbooking.